Here's the instructions for making candi sushi! This tastes really sweet and yummy! I've been trying to like back to this site for a while, but i coudn't find it! 1. Melt margarine in large saucepan over low heat. Add marshmallows and stir until completely melted. Remove from heat. Then arrange your workspace with a large try (such as a cutting board), your bowl of cereal treat mix, and a bowl of water. During this whole stage, you want to keep your hands (particularly fingers) constantly moist. The rice cereal is VERY sticky and hard to mold unless you keep this in mind. You don't want your hands too wet, but definitely not too dry either. Now take about half of the mix and divide it into three sections. Take one section and flatten it out into a long rectangle. Lay gummi worms along the middle of the rectangle. Carefully roll the rectangle up around the worms to create a tube. This is the main part of our maki. Take the other half of the mix and form it into little oval-shaped patties. These will be the bases for our individual pieces. In the picture you can see three tubes of rice cereal mix and gummy worms next to nine rice patties. Clear room in your fridge and put the whole tray inside. You'll need to keep these guys cool while you decorate them individually. 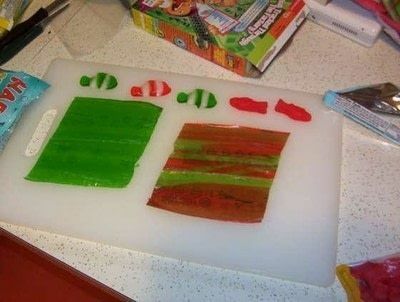 Lay out two full sheets of fruit roll-up candy and any fish that you are planning to use for the individual pieces. 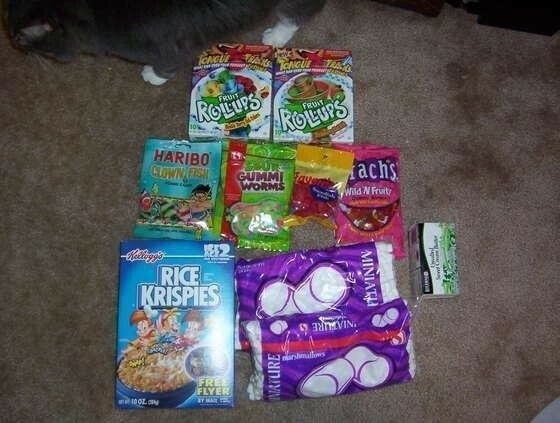 Cut the fruit roll-ups into about half inch strips. Smoosh a single fish gummy onto a rice patty. The stickiness of the rice cereal mix should hold it relatively well. Now take a strip of fruit roll-up and wrap around the fish-cereal creation. Press the roll-up firmly against the rice cereal in particular so that it sticks well. Lay out more fruit roll-up sheets. Cut each sheet into approximately 1 inch sections. Take a single roll out of the fridge. Slice into about 1 inch sections with a knife (I found serrated worked best). 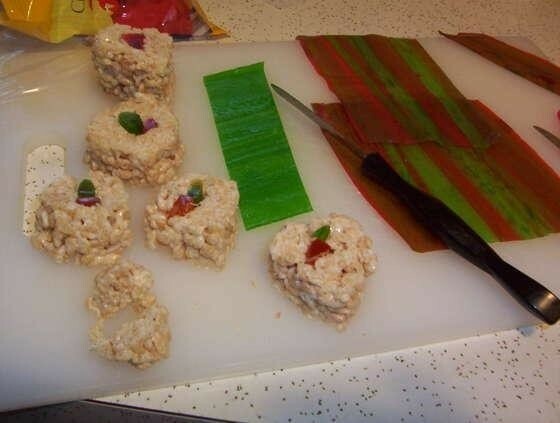 Wrap the fruit roll-up around the maki pieces, making sure to press it into the rice cereal so that it sticks well. You may want to straighten the ends of the rolls by chopping off the excess. How cute! 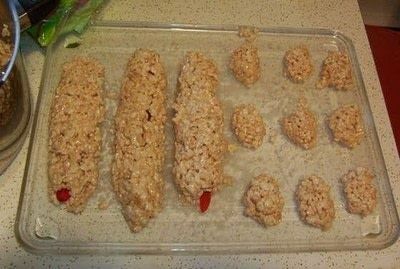 I will surely be making these this holiday season! 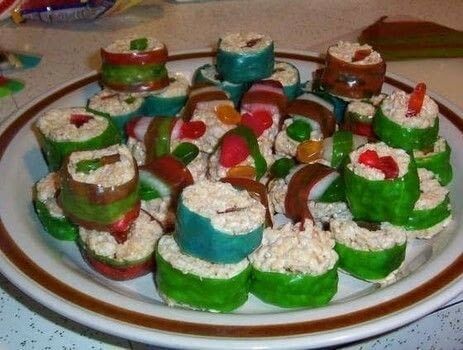 I love sushi, now I love it even more! These sound great and unique and would go over great at a carry in. Thanks for sharing this with us. And taste yummy too! Good idea. These are so much fun, i just made some...and of course forgot to take pictures as i went...but to my credit, hands were a little sticky.. I wanted to add, you can save yourself a step (and about an hour!) if you dont cut the fruit roll ups and just wrap the whole role and then slice as an already wrapped piece. This is such an awesome idea... I love it!